n 2009, Greece experienced an economic collapse that lasted longer than the Great Depression in America. Adding to the economic problem was the exodus of thousands of people from the country, searching for better living conditions abroad and resulting to an inevitable brain drain that will resonate for decades to come. Another one of its dire consequences was the downward spiral of the local marketplace that had a negative impact on the majority of businesses, from large companies to small-scale ventures. Indeed, the Greek debt crisis has changed normal behavior and expectations, yet opportunities arose even among the ones affected the most. 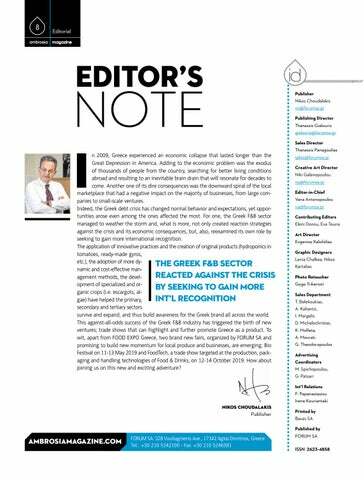 For one, the Greek F&B sector managed to weather the storm and, what is more, not only created reaction strategies against the crisis and its economic consequences, but, also, reexamined its own role by seeking to gain more international recognition. The application of innovative practices and the creation of original products (hydroponics in tomatoes, ready-made gyros, etc. ), the adoption of more dyThe Greek F&B sector namic and cost-effective manreacted against the crisis agement methods, the development of specialized and orby seeking to gain more ganic crops (i.e. escargots, alint’l recognition gae) have helped the primary, secondary and tertiary sectors survive and expand, and thus build awareness for the Greek brand all across the world. This against-all-odds success of the Greek F&B industry has triggered the birth of new ventures; trade shows that can highlight and further promote Greece as a product. To wit, apart from FOOD EXPO Greece, two brand new fairs, organized by FORUM SA and promising to build new momentum for local produce and businesses, are emerging: Bio Festival on 11-13 May 2019 and FoodTech, a trade show targeted at the production, packaging and handling technologies of Food & Drinks, on 12-14 October 2019. How about joining us on this new and exciting adventure?